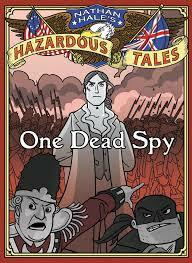 I’m so happy to see that graphic novels are expanding to include history, mythology, and adaptations of classics. I have a few readers who will not read anything unless it’s in graphic novel format. They’re big readers and are in the library always looking for new books. They are really excited about this series. I’m excited, because they’re reading American History! This new series, Nathan Hale’s Hazardous Tales is a funny recounting of the story of Nathan Hale, the Revolutionary War spy who famously said, “I regret that I have but one life to give for my country.” In this version, Nathan Hale and the hangman are discussing “last words” and the fact that Nathan Hale should say something memorable before he is hanged. Nathan Hale not only thinks of his last words, but then delays his hanging by recounting the story of the seige of Boston, the Battle of Bunker Hill, and General Howe’s invasion of New York. This is real American history but presented in a funny and engaging way. I laughed out loud several times at the cleverness of the book. There are two books in the series so far, One Dead Spy and Big Bad Ironclad and more to come. (Thank goodness!) My only regret… is that the pages are not full-color. I think it would add a lot to the book if the illustrations were more attractive. That said, it’s a great series and kids love it.